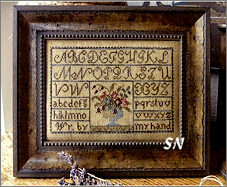 Here are three designs by Threadwork Primitives that are not new... but we have finally organized them together for you! 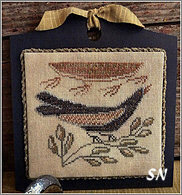 All presented as charts, everything uses hand-dyed flosses and various neutral shades of hand-dyed linens. 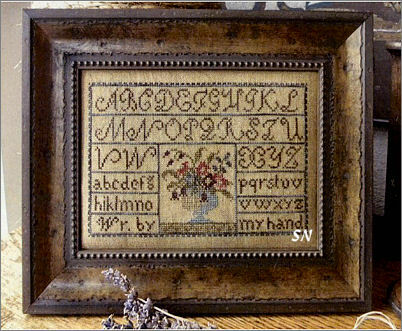 Painted Threads finishes 7 x 4-1/4 on 36ct. Just 7 colors on here... really sweet. 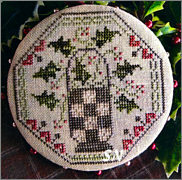 The center floral urn would make a stunning pin cushion -- it's only 40 x 40! 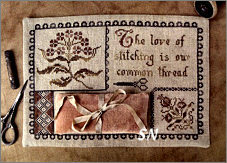 Growing Love finishes 6 x 8. 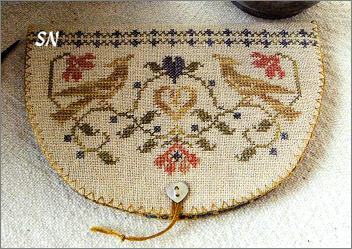 Inspired by an antique oval needlebook, the design shape lends itself to that treatment -- pretty and unique. 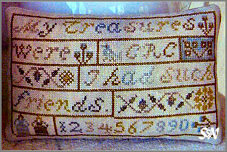 Choose your fabrics, and after stitching is finished, distress them a little if you like! 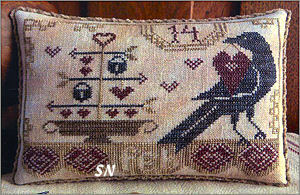 Sunbird measures approx 4 x 4, just 5 colors of hand-dyeds. 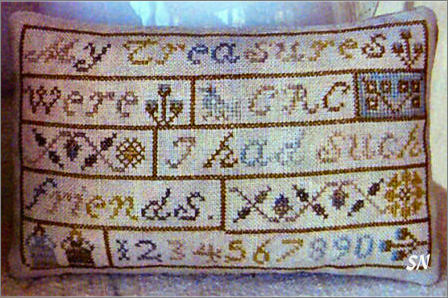 My Treasures finishes just 4 x 7 and is dedicated to stitching friends. A super-easy stitch -- your friends would love you! 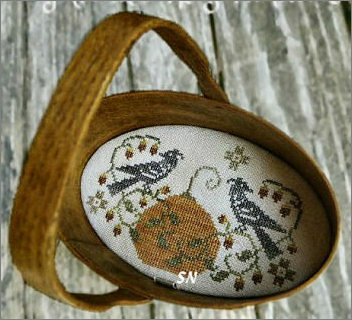 A pair of quick designs for Autumn. 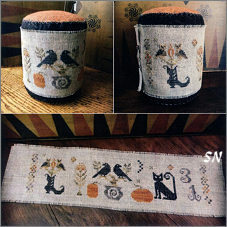 Halloween Menagerie is actually stitched as a flat band that is then wrapped around a felted wool drum-shaped pin cushion. 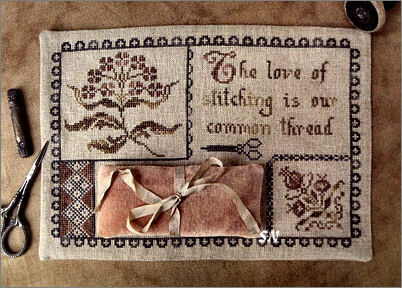 Just 5 or 6 colors of hand-dyed threads... neither one will take you long to stitch. Bittersweet October is shown tucked into a wooden shaker carrier, and would also make a cute oval cushion -- it's only 3 x 5. 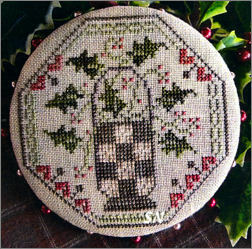 Quaker Holly -- This little round greenery design is finished into a pin wheel -- which would make a REALLY COOL stitcher's ornament! Get a pair of our finishing forms... cover, glue, add some trim and poke in pins and zip-zap you've got a super-cute ornament with a no-sew-finish!!! 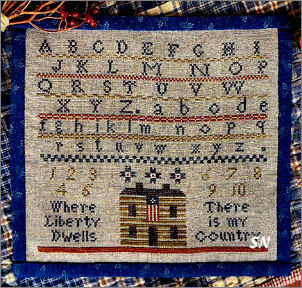 Where Liberty Dwells is on the super-primitive end of things... at least the spaces between the alphabet letters give that impression. 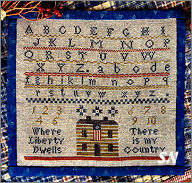 Finishes approx 8 x 9, you could stitch the house one side of a little cushion and the verses on the other as another design option.